Wealth thru Wellness Will Seal Those Leaks Forever! Wealth thru Wellness is an onsite step-by-step guide to a successful and sustainable Workplace Wellness Program. Utilizing a 5 pillar of health approach improves the overall health and well-being of your employee by educating your staff on how easy it is to be proactive in making healthy lifestyle choices which will increase their productivity improve their health and increase the profits in your company! 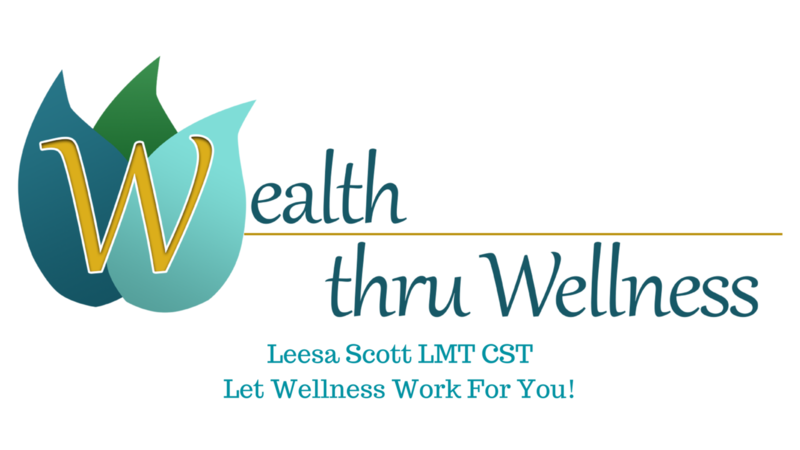 Leesa Scott, LMT, CST has owned an operated a Wellness practice since 1994. She built this practice through physician referrals where she soon caught the eye of The Ohio State Medical Center. Leesa, along with a few other experts in their field of Wellness, was asked to help open The Center for Integrative Medicine at OSU. Her extensive education in Wellness has been her passion and offered her opportunities to teach both Nationally and Internationally. Through these years Leesa has recognized how conventional medicine and wellness programs aren't typically successful long-term which caused her to develop and implement the Wealth thru Wellness Programs in her private practice. The results of her clients blow her away! After 25 years in private practice, Leesa decided to bring this information to businesses to help them help their employees and increase their company's profits. Healthy, Wealthy & Wise offer a lot of value for increasing the overall health and wellness of each participant. They do this by giving personalized attention to the needs of your employees in each of the 5 pillars of health which are; Positive Thoughts, Rest, Alignment, Nutrition, and Action.